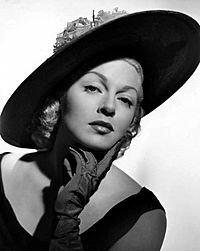 Lana Turner (February 8, 1921 - June 29, 1995) was an American actress. She was born in Wallace, Idaho. She was first discovered and signed into movie contract by MGM when she was 16. She played mainly feature roles and was one of Hollywood's first scream queens. She would become very popular in the 1940s and 1950s. Turner appeared in the television series Falcon Crest during 1982 and 1983. The actress died from throat cancer in 1995 in Century City, Los Angeles. Turner in The Postman Always Rings Twice, considered by many critics to be one of her career-defining performances. Turner with George Cukor on the set of A Life of Her Own (1950). Turner promoting Imitation of Life in New York City, March 26, 1959. Turner with husband Joseph Crane and newborn daughter, Cheryl; September 1943. Turner visiting the Point Vicente Lighthouse, 1941. Lana Turner Facts for Kids. Kiddle Encyclopedia.